Bedford Athletic cantered to a 91-0 demolition of Spalding on Saturday. The first half of Midlands 1 East fixtures is complete with Ath in fifth, ten points behind leaders Syston. A first team record-equalling five tries from Ben Johnson and Tom Dolemore laid the foundations for the win. Fifteen tries also equalled the record for a league game and the side finished one point short of equalling their record winning margin in the league, strangely enough against the same opposition. Dolemore crossed for the first two tries to settle any early nerves. Johnson ran a poor clearance back through the whole Spalding side for his first try and in the 28th minute Dolemore had his hattrick.Sven Meiland crashed through for the fifth on 31 minutes and Ben Johnson was on hand to add a sixth on 35 minutes. Ath led 36-0 at half time. The opening minutes of the second half were one way traffic as David Simpson, Dolemore (with his fourth) and Charlie Darlow all crossed. 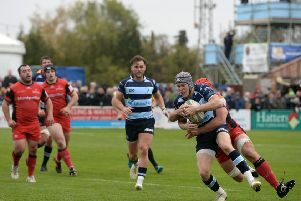 A forward pass stopped the home side’s momentum but when Rob Watkins turned the ball over at a ruck the backs attacked quickly with Dolemore crossing for his fifth. Darlow with a trademark run scored his second and Johnson completed his hat trick. With quarter of an hour left the referee had to be replaced due to a hamstring injury and his substitute oversaw three further tries through Tommy Mills and two from Johnson. Dolemore and Johnson were joint SB Construction Management men of the match. Ath now host Belgrave on Saturday at 2.15pm.